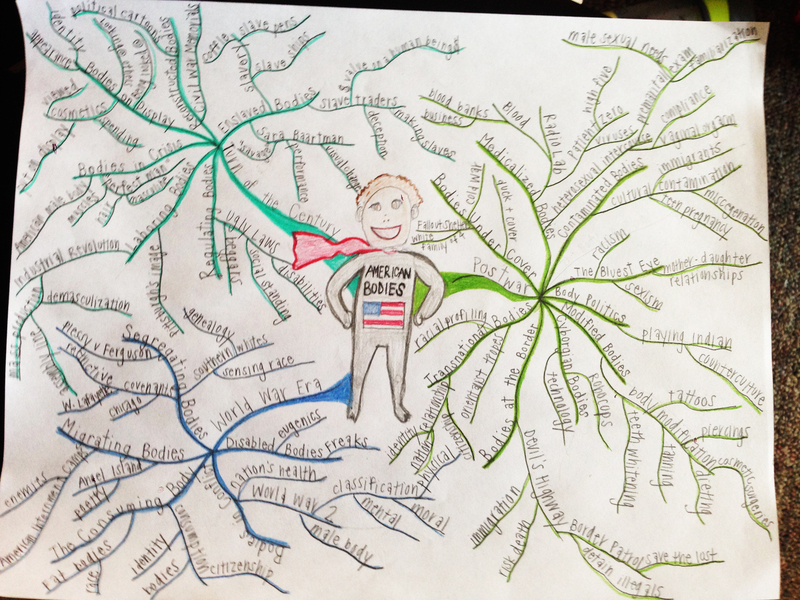 In my American Studies courses I ask students to construct a mind map with an accompanying essay reflecting back on the course. The assignment aims to secretly get students to think about a structural analysis of power. For this assignment, students were asked to reimagine the course structure by choosing a few of the course readings, films, lectures, etc. 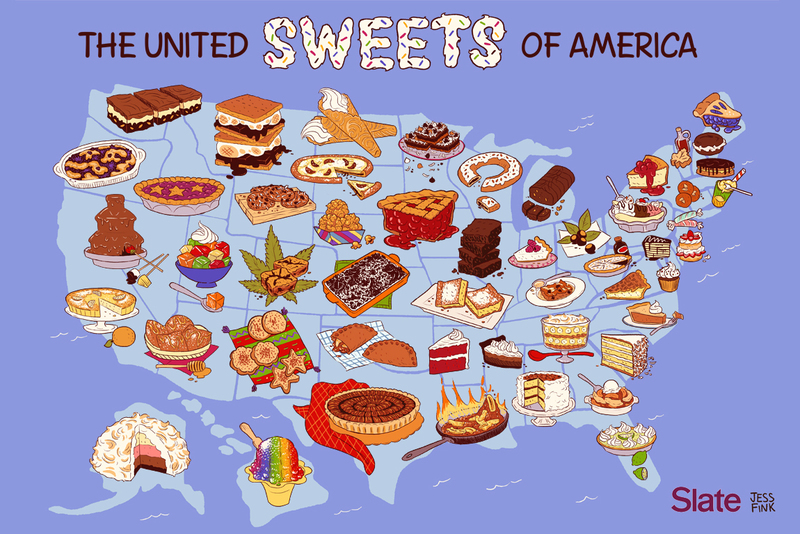 and lumping them into new categories and linking these categories and topics. It might sound a bit confusing, abstract, or a little hippie granola for you, but when executed correctly produces beautiful, thought-provoking images that evidence students reflecting critically on the course material. 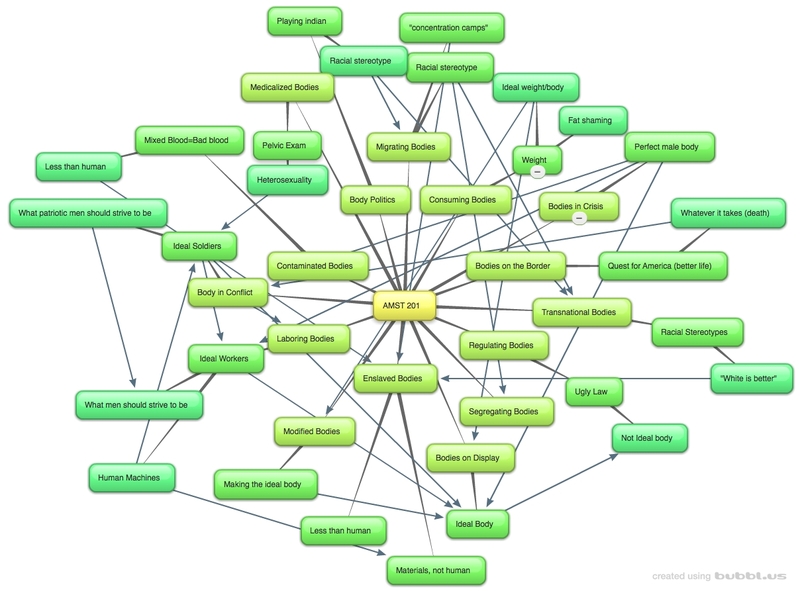 I show them this mind map as an example and tell them that the center of the mind map should be their overarching argument — each branch shooting out from the center should be a main theme, and then the smaller lines attached to those main theme branches should be their evidence to prove their argument. 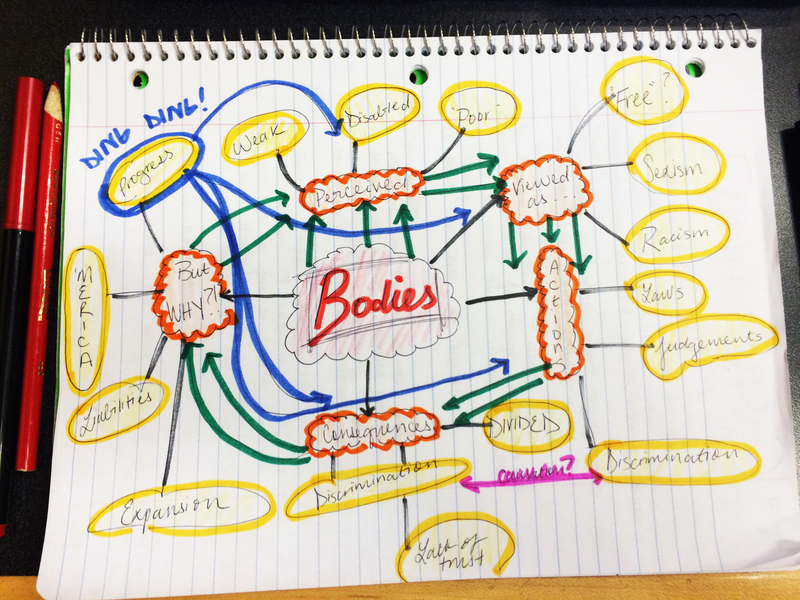 I use that mind map example because many others that you can find through Google are not intending to evidence an argument and, therefore, tend to be more descriptive brainstorming maps than a tool for visualizing a thesis. However, unlike that mind map example linked above, students are asked to build off the main theme branches with evidence from the course. These offshoots from the main themes can be organized in whatever fashion they want. Sometimes you’ll find clear linkages and in other cases huge messy clouds of connections. 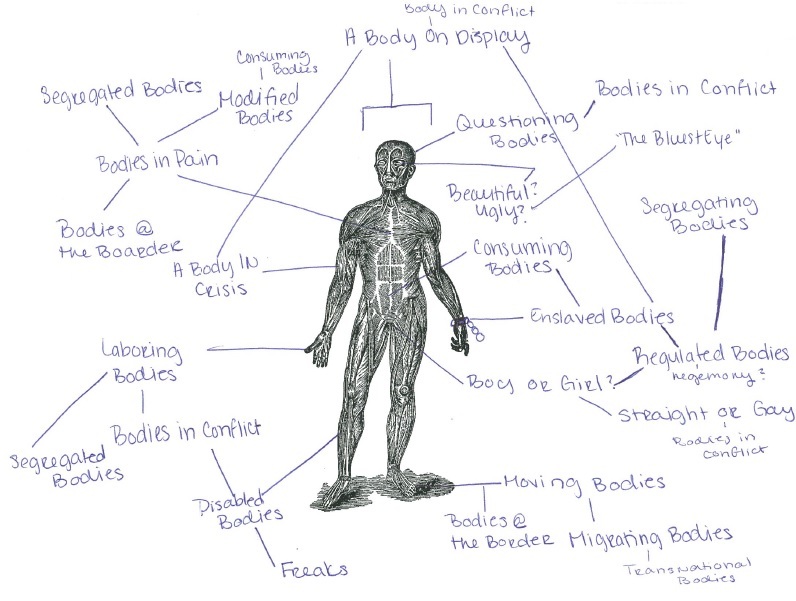 A brief 1-page explanatory essay accompanies the image in order to articulate the student’s argument and evidence why those themes, offshoots, and connections/linkages were selected. Students can create these mind maps whatever way they’d like — via 3D model, video, Powerpoint, drawn by hand, or using some of these programs. “It is not everyday when you think about people and their mindsets/values as “bodies”. When we start to think of bodies and how they are shaped and characterized by society, I realized how we start to perceive them. Bodies such as women, people of color, or those who are poor are seen as “weak”, “disabled”, and even not worth “saving”. These perceptions lead to the image they have on society. They are viewed as these things with the help of racism and sexism. Are these bodies really “free” in the Land of the Free and the Home of the Brave if they cannot even be seen as equal? 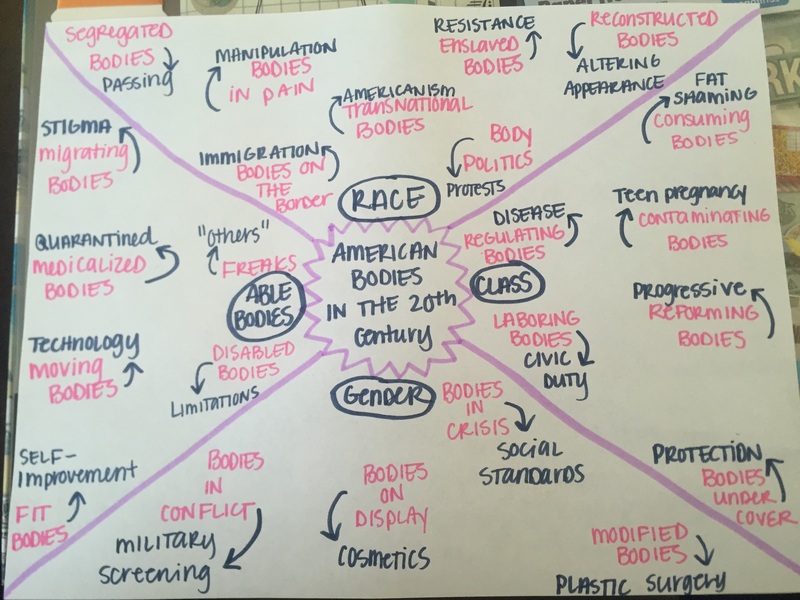 Ultimately, the assignment worked pretty well in getting students to explore the relationship between group identities and intersectionality. Having recently spoken with Julian Chambliss about his use of infographics in the classroom almost as research reports, I’m determined to find new ways of incorporating visual and experiential modes of communication and critical thinking into courses that moves beyond strictly reading and writing. Have other ideas? Share them with me! Photograph by Mel Melcon/Los Angeles Times – This is a photograph of a mural in LA called The Great Wall that highlights the experiences of communities of color in America’s history. 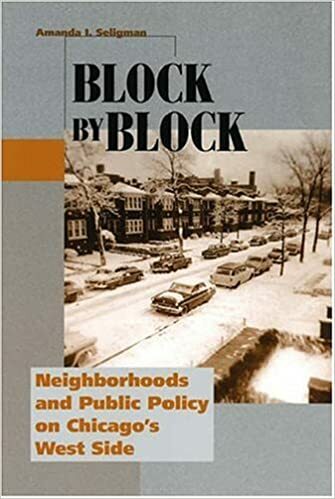 In November of 2015 I presented my research on Berkeley’s People’s Park at SACRPH – The Society for American City and Regional Planning History. Because the conference was based in LA, many panels that put theorists, practitioners, and historians in conversation addressed local concerns over the right of the masses to the city. One of the most engaging panels included presentations by Cathy Gudis and Eric Avila who, in different ways, evidenced a public visual culture “from below” with rich examples of people staking claim to urban space in LA. Eric showed his own photographs of The Great Wall – a mural painted on a concrete barrier trailing 2754 feet on Canyon Ave by artist Judy Baca – which offers vivid snapshots in America’s history and experiences of communities of color. More than just acknowledging their existence, the mural captures struggles over power embedded in urban space, such as this segment that portrays how local and state governments backed with federal funding seized land owned by people of color to build highways, universities, and more. This segment shows how the state demolished Chavez Ravine, a Mexican American neighborhood in LA, to make way for a new highway and the Dodger’s Stadium that divided the barrios and fragmented the Mexican American community. 36 portraits of Skid Row visionaries by street artist Mr. Brainwash. Offering a contemporary lens, Cathy shared her own experiences working with the bi-annual Walk the Talk parade held by the LAPD (LA Poverty Department) in Skid Row – home to the largest homeless population in the US. My own experience staying in Skid Row for the SACRPH conference was eye-opening. I was absolutely stunned at how many people were living on the street in clumped tent cities. The parade functions as an affront to cultural norms and policies discouraging citizens and tourists from venturing into Skid Row and talking with its itinerant residents. Marchers carrying musical instruments and posters showing the faces of dead and still surviving homeless residents process through the neighborhood. The parade is part of a series of events facilitated by the LAPD that engages the community in discussions to identify initiatives and people who have made positive contributions to Skid Row. Photo by Genaro Molina/Los Angeles Times, Walk the Talk parade participants march from Gladys Park led by the Mudbug Brass Band and stopping for sketches celebrating local activists. What events and places in your community highlight the experiences of people of color in American past and present?